10-8-04: Here is the Scooter boat I launched back on 5-15-04. I followed the plans pretty close with the exception of the console. I took measurements from a factory built boat for a more up to date look. The entire boat was glassed and epoxy coated. 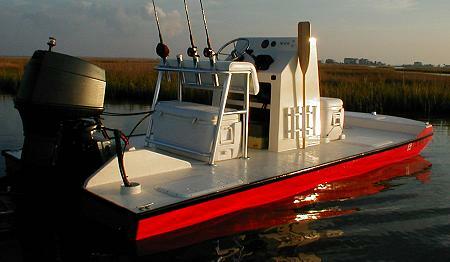 It has a 70hp outboard with a jack plate allowing it to run in some real skinny water.